Watch “Harvester perspectives on alewives, blueback herring, and American eels in Downeast Maine” oral history video series. The American eel is the only species in the Gulf of Maine that spends most of its life in fresh water but spawns at sea (a life cycle known as catadromy). American eels are born in the Sargasso Sea, a large area of the Atlantic Ocean south of Bermuda and east of the Bahamas. American eel larvae (known as leptocephali) are transported by ocean currents for nearly a year until they reach the east coast of North America. As they near the coast, leptocephali metamorphose into an early juvenile stage known as a glass eel. The timing of the arrival of glass eels along the coast of Downeast Maine is driven by water temperature and usually takes place around late March or early April. As glass eels migrate into freshwater streams, rivers, and ponds they develop the brown pigmentation that is characteristic of adults. At this stage they are called elvers and are still quite small, averaging about 50-90 mm in length. 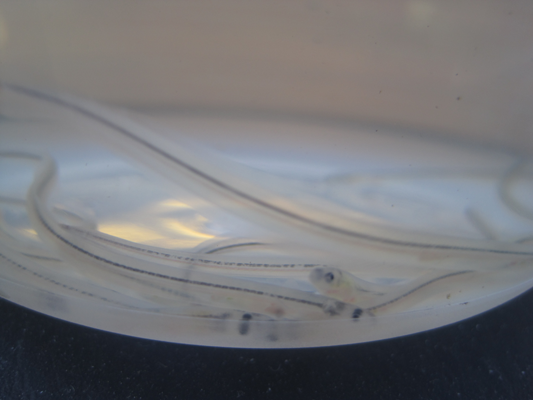 Elvers grow into a later juvenile stage known as a yellow eel (Collette and Klein-MacPhee 2002). The distinction between an elver and a yellow eel is somewhat arbitrary. The transition between the two phases is not a true metamorphosis but rather a gradual growth from the small elver to the larger yellow eel (Dr. James McCleave, personal communication). By the end of the yellow eel phase, male eels in Maine rivers are usually 35-40 cm long and females are usually 50-60 cm in length (Oliveira and McCleave 2000). The yellow eel stage is the longest of the eel life stages, lasting from six to sixteen years for male eels and ten to twenty years for female eels in Maine’s rivers (Oliveira and McCleave 2000). During this time the eels feed, grow, and store the energy needed to make the long migration to the Sargasso Sea to spawn. As the eels near reproductive maturity they undergo further morphological and physiological changes and return to the sea to spawn. The adult migratory stage of the American eel is known as a silver eel (Atlantic States Marine Fisheries Commission 2000, Collette and Klein-MacPhee 2002). American eels have been harvested in Downeast Maine for hundreds of years. 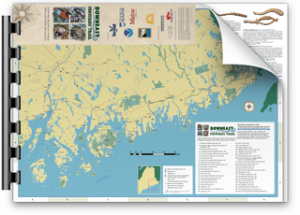 To learn more about the history of eel fishing in Downeast Maine, see the Fisheries Then section of this site. American eel fisheries in Maine are rapidly changing as fishery management regulations change to address increased fishing pressure and concern for American eel abundances range-wide. What follows is meant to describe American eel fisheries in Downeast Maine from the 1970s through 2014. Since 2013 harvest of silver eels has been virtually prohibited in Maine. Prior to that time both silver and yellow eels were harvested for use as bait and to supply food markets. Small amounts of yellow eels are still harvested for bait for sportfish such as striped bass; however, neither yellow nor silver eels are currently harvested in any significant numbers for human consumption. Throughout the 1990s yellow and silver eels caught in Maine were shipped to ethnic markets in cities such as Boston and New York (Dwayne Shaw, personal communication) and to foreign markets in Europe and Asia (Ewart 1997; Fred Kircheis, personal communication). Since the late 1990s, the number of yellow and silver eels harvested to supply food markets has declined as the amount of eels supplied by aquaculture operations has increased (more on that below). Yellow and silver eel landings in Maine fluctuated over the past several decades in response to market fluctuations and changing fisheries regulations, reaching a high of 191,025 pounds in 1976. Compared to Maine’s commercial fisheries for many other species, yellow and silver eels were not harvested in large quantities, nor were they a major source of revenue for the state as a whole during the latter half of the twentieth century (Atlantic States Marine Fisheries Commission 2013, Maine Department of Marine Resources 2014b). In 1996 the Maine Department of Marine Resources and the Department of Inland Fish and Wildlife began to phase out silver eel fisheries throughout the state by prohibiting new entry into the fishery. The intent of this regulation was to allow more silver eels to return to the Sargasso Sea to spawn. By 2010 only a few individuals were licensed to harvest silver eels in Maine (Gail Wippelhauser, personal communication). The fishery was shut down in 2013 when the Atlantic States Marine Fisheries Commission (the interstate fisheries management agency that oversees eel fisheries management in all East Coast states) prohibited the use of gear other than baited traps and spears to harvest American eels from September through December (Atlantic States Marine Fisheries Commission 2013). Silver eels are found in Maine in the highest abundances during the fall when they undergo a variety of physical and physiological changes in preparation for their migration to the Sargasso Sea (Collette and Klein-MacPhee 2002). During this metamorphosis, the digestive system degenerates and ceases to function (U.S. Fish and Wildlife Service 2011a). Because silver eels do not feed on their seaward migration, the prohibition of the use of gear other than spears (not typically used in modern times) and baited pots effectively banned silver eel fishing in Maine and in most other East Coast states. Prior to this regulatory change, silver eels were mostly harvested with weirs, which are structures used to guide migratory fish into a trap. While yellow and silver eel fisheries declined in Downeast Maine during the latter half of the twentieth century, the glass eel fishery has grown tremendously. (In Downeast Maine the glass eel fishery is often referred to as an elver fishery, though technically the eels harvested are not yet elvers.) Glass eels were first exported from the U.S. to Japan in 1969 (Tzeng et al. 2009). This export trade grew for several years until weak international markets caused it to collapse in the late 1970s. It remained at a low level until the 1990s when it grew substantially (Atlantic States Marine Fisheries Commission 2000). Since the mid-1990s there has been a consistent export market for glass eels caught in Maine; however, participation and landings have fluctuated greatly over the past two decades in response to wide fluctuations in export prices (Maine Department of Marine Resources 2014a, Atlantic States Marine Fisheries Commission 2014). High demand for eels in Japan was (and is) the major driving force behind the growth of the glass eel trade in Maine. The Japanese eel (Anguilla japonica) is a popular food in Japan but over the past three decades Japanese eel abundances have declined significantly. In June 2014 the Japanese eel was listed as endangered on the International Union for Conservation of Nature and Natural Resources’ Red List (Jacoby and Gollock 2014). To meet high local demand in the face of greatly diminished local eel abundances, Japan has invested heavily and made significant advances in eel aquaculture; however, captive breeding has not yet been successful at a commercial scale and eel cultivation still relies on the capture of juveniles from the wild (Masuda et al. 2010). In recent years major eel aquaculture operations have become established in Japan, mainland China, Taiwan, and South Korea (Crook and Nakamura 2013). Because Anguilla japonica abundances declined to levels too low to support commercial aquaculture operations, Asian aquaculture facilities began to purchase increasing quantities of American and European eels (Anguilla anguilla, a close relative of the American eel) starting in the 1970s (Tzeng et al. 2009). Export of European eels was banned under the Convention on International Trade in Endangered Species in 2007 (Jacoby and Gollock 2014). This ban came into effect in 2009 and acted in conjunction with declining Japanese eel stocks (and, according to some, market disruptions caused by the 2011 tsunami) to cause the price of glass eels exported from the U.S. to increase dramatically in 2012. Though nine East Coast states have exported glass eels, all states except for Maine and South Carolina have prohibited the harvest of glass eels since 2001 or earlier (Atlantic States Marine Fisheries Commission 2012). The fishery in South Carolina is much smaller than that in Maine. The South Carolina fishery is restricted to one river and ten harvesters. When Japanese demand for glass eels surged in 2012, the vast majority of the glass eels exported from the U.S. came from Maine. The average price per pound throughout the ten-week season in 2012 was $1,866, reaching highs of over $2,000 per pound for a brief period in some locations. The Maine glass eel fishery generated almost $39 million in 2012 and was the second most profitable fishery in state, second only to the lobster fishery. Prices remained high through 2013 and 2014 (Maine Department of Marine Resources 2014a, Maine Department of Marine Resources 2014c). With such a tremendous increase in prices, the glass eel fishery brought a huge economic benefit to many harvesters. This fishery is especially helpful in Downeast Maine, where there are fewer economic opportunities than other parts of the state. 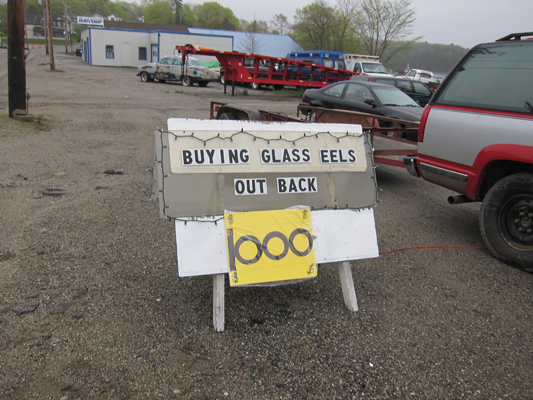 Harvest of glass eels is allowed in Maine from late March through the end of May, which normally coincides with peak glass eel migration into Maine’s coastal waters. The fishery takes place entirely at night when the eels are most active. Catches are highest around high tide when the sky is dark. A full moon can light up the sky enough to significantly reduce catches (Randall Bushey, Julie Keene, William Milliken, personal communication). Dip nets and fyke nets are the only gear types permitted for harvesting glass eels in Maine (Maine Department of Marine Resources 2014d). Dip nets are hand-held nets with long handles. Fyke nets are funnel-shaped nets with two mesh wings that are attached to the bottom of the river or stream’s edge that guide fish into the net. Some fishermen and women who met eligibility requirements based on participation in the fishery during a specific time period in the 1990s are allowed to use two pieces of gear. Most harvesters are permitted only one piece of gear. For the most part, harvesters may choose between a dip net and a fyke net. New licenses are currently awarded through a lottery, with separate lotteries held for fyke nets and dip nets. New licenses are only awarded when other licenses are revoked or not renewed. The choice between a dip net and a fyke net is partly a matter of personal preference and partly a matter of which licenses are available in a given year (Maine Department of Marine Resources 2014d). The timing of the glass eel migration depends on water temperature. The earliest glass eels enter Maine’s coastal waters shortly after the ice thaws each spring. Early in the commercial season the eels are usually more abundant in southern coastal Maine than in Downeast Maine because the coastal waters of Downeast Maine are usually slower to thaw than those farther south. Many glass eel fishermen move from river to river during the fishing season to target the eels where they are most abundant. In a recent interview, Darrell Young, a glass eel fisherman from Eastbrook, Maine, explained how harvesters follow the eels: “We start out in the little brooks and we end up in the big rivers. There’s more eels in the big rivers, of course but the little brooks warm up quicker so we start out there.” The Penobscot River and its tributaries are popular among glass eel fishermen later in the season (William Milliken and Darrell Young, personal communication). Since the 1990s the state of Maine and the Atlantic States Marine Fisheries Commission have been trying to develop effective fishery management regulations for yellow, silver, and glass eel fisheries at the state and federal level in the face of considerable scientific uncertainties. All American eels throughout their range from southern Greenland to northern South America belong to one intermixed population (Cote et al. 2013, Pujolar 2013). This, in conjunction with the complex American eel life cycle and their ability to inhabit a wide variety of habitats, poses challenges for assessing range-wide population trends and for predicting the impact that different fishery regulations may have on the population as a whole. In the mid-1990s Maine implemented some of the first regulations on the harvest of glass eels in the United States. These regulations included a defined fishing season with weekly closed periods, limits on allowable gear types and number of pieces of gear per harvester, restrictions on harvest locations, and increased license fees (Atlantic States Marine Fisheries Commission 2000). In the late 1990s the Maine Department of Marine Resources limited the number of participants in the fishery; however, this did not directly impact the amount of glass eels harvested. Total landings continued to reflect market trends rather than the number of licensed fishermen. Those who remained in the fishery fished hard to increase their catches when the price was high (Atlantic States Marine Fisheries Commission 2000, Maine Department of Marine Resources 2014a). In 2014, under pressure from the Atlantic States Marine Fisheries Commission to reduce glass eel landings from 2013 levels, the Maine Department of Marine Resources implemented individual fishing quotas on the glass eel fishery for the first time. 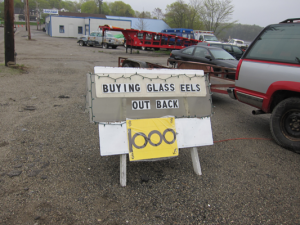 Prior to 2014 there was no limit on the total amount of glass eels that could be harvested from Maine’s coastal waters besides the limitations imposed by gear and season regulations. In 2014, for the first time, Maine also required licensed harvesters to use individualized swipe cards when selling glass eels to a dealer. These cards helped the Department of Marine Resources to collect timely data, ensured that harvesters did not exceed their individual quotas, and made poaching much more difficult than in previous years (Maine Department of Marine Resources 2014c). The new regulations imposed on the glass eel fishery in 2014 appear to have met their goals of capping glass eel landings and reducing illegal activity; however, several issues remain unresolved, including issues surrounding tribal fisheries management in Washington County. Fisheries biologists and fisheries managers throughout the East Coast have expressed concern for American eel abundances since at least the 1970s, when landings data and fisheries independent monitoring surveys first suggested that eel stocks were in decline (Atlantic States Marine Fisheries Commission 2000, Atlantic States Marine Fisheries Commission 2014). A 2012 benchmark stock assessment by the Atlantic States Marine Fisheries Commission found that American eel stocks throughout the U.S. were depleted compared to historic abundances. Yellow eel abundances appear to have declined throughout much of their range (Atlantic States Marine Fisheries Commission 2012). Trends in glass eel abundances are less clear (U.S. Fish and Wildlife Service 2007, Atlantic States Marine Fisheries Commission 2012). Range-wide declines in yellow eel abundance are likely due to a combination of factors including fishing pressure, habitat loss, mortality at hydroelectric dams, pollution, disease, and changing ocean conditions (Haro et al. 2000, Council on Endangered Species Act Reliability 2010, Atlantic States Marine Fisheries Commission 2012). Over the past decade, petitions from private citizens and advocacy organizations have twice led to formal consideration of the possibility of listing American eels as endangered or threatened under the Endangered Species Act (ESA). A 2004 petition initiated a formal status review by the U.S. Fish and Wildlife Service (FWS). In 2007 the FWS announced that listing under the ESA was not warranted, stating that the American eel population was buffered from extinction risk due to its flexible use of a variety of freshwater, estuarine, and marine habitats, its wide distribution, and random larval dispersal throughout its entire range from southern Greenland to northern South America. Additionally, the status review revealed no evidence of population-level effects from pollution, parasites, competition with non-native species, or mortality at hydroelectric dams (U.S. Fish and Wildlife Service 2007). 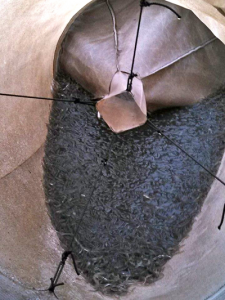 This finding, however, did not end concern for the status of the American eel population. In 2010 the U.S. Fish and Wildlife Service was again petitioned to list American eels under the ESA (Council on Endangered Species Act Reliability 2010). In 2011 the FWS agreed that listing may be warranted and began work on an updated assessment of the American eel population. The agency is required to make a listing decision by September of 2015 (U.S. Fish and Wildlife Service 2011b, Atlantic States Marine Fisheries Commission 2014). This upcoming decision could greatly impact Maine’s eel fisheries. In light of impending decisions by the Atlantic States Marine Fisheries Commission and the U.S. Fish and Wildlife Service, several of Maine’s commercial glass eel fishermen and women formed the Maine Elver Fishermen’s Association in 2013. The organization aims to support sustainable fisheries management and “encourage community-based management plans that ensure the health of the elver fishery so they can be harvested annually” (Maine Elver Fisherman’s Association 2013). The new organization has worked hard to lobby the state of Maine and the Atlantic States Marine Fisheries Commission to keep the fishery open. To this end, they have been successful thus far; however, with the impending Endangered Species Act listing determination by the U.S. Fish and Wildlife Service, the future of Maine’s glass eel fishery beyond the next few years remains uncertain. Atlantic States Marine Fisheries Commission. 2000. Interstate fishery management plan for American eel. ASMFC Fishery Management Report No. 36. Atlantic States Marine Fisheries Commission. 2012. American eel benchmark stock assessment. ASMFC Stock Assessment Report No. 12-01. Atlantic States Marine Fisheries Commission. 2013. Addendum III to the fishery management plan for American eel. Atlantic States Marine Fisheries Commission. 2014. Draft addendum IV to the fishery management plan for American eel for public comment. Collette, B.B., and G. Klein-MacPhee. 2002. Bigelow and Schroeder’s Fishes of the Gulf of Maine, third edition. Washington, DC: Smithsonian Books. Côté, C.L., P. Gagnaire, V. Bourret, G. Verreault, M. Castonguay, and L. Bernatchez. 2013. Population genetics of the American eel (Anguilla rostrata): Fst=0 and North Atlatic Oscillation effects on demographic fluctuations of a panmictic species. Molecular Ecology 22:1763-1776. Council on Endangered Species Act Reliability. 2010. Petition to list the American eel (Anguilla rostrata) as a threatened species under the Endangered Species Act. Submitted April 30, 2010 to U.S. Fish and Wildlife Service, Washington D.C. and Sacramento Field Office, California. Crook, V., and M. Nakamura. 2014. Glass eels: assessing supply chain and market impacts of a CITES listing on Anguilla species. Traffic Bulletin 25(1): 24-30. Ewart, J.W. 1997. Live shipping of aquatic products in the northeastern region: an overview. Proceedings of the 1996 International Conference on the Marketing and Shipping of Live Aquatic Products, Seattle, WA, darc.cms.udel.edu/nelivef97.html. Haro, A., W. Richkus, K. Whalen, A. Hoar, W.D. Bush, S. Lary, T. Brush, and D. Dixon. 2000. Population decline of the American eel: implications for research and management. Fisheries 25(9):7-16. Jacoby, D., and M. Gollock. 2014. Anguilla japonica. The IUCN Red List of Threatened Species version 2014.2, iucnredlist.org. Maine Department of Marine Resources. 2014a. Historical Maine American eel (elver stage) landings, 1964-2013, maine.gov/dmr/commercialfishing/historicaldata.htm. Maine Department of Marine Resources. 2014b. Historical Maine American eel (yellow/silver stage) landings, 1964-2013, maine.gov/dmr/commercialfishing/historicaldata.htm. Maine Department of Marine Resources. 2014c. Maine’s 2014 elver season a success for roll out of new swipe card and quota systems, maine.gov/dmr/2014ElverSeason.htm. Maine Department of Marine Resources. 2014d. Marine Resources Laws and Regulations, Chapter 32. Eel regulations. Maine Elver Fisherman’s Association. 2013. Bylaws of the Maine Elver Fisherman’s Association. Masuda, Y., H. Imaizumi, K. Oda, H. Hashimoto, H. Usuki, and K. Teruya. 2010. Artificial completion of the Japanese eel, Anguilla japoinica, life cycle: challenge to mass production. Bulletin of the Fisheries Research Agency 35:11-117. Oliveira, K., and J.D. McCleave. 2000. Variation in population and life history traits of the Americal eel, Anguilla rostrata, in four rivers in Maine. Environmental Biology of Fishes 59:141-151. Pujolar, J.M. 2013. Conclusive evidence for panmixia in the American eel. Molecular Ecology 22:1761-1762. Tzeng, W., Y. Han, and B.M. Jessop. 2009. Growth and habitat residence history of migrating silver American eels transplanted to Taiwan, in Eels at the Edge: Science, Status, and Conservation Concerns (Casselman, J.M., and D.K. Cairns, editors). American Fisheries Society Symposium 58. Bethesda, MD: American Fisheries Society. U.S. Fish and Wildlife Service. 2007. Endangered and threatened wildlife and plants; 12-month finding on a petition to list the American eel as threatened or endangered. Federal Register. Vol. 72. No. 22. February 2, 2007. Proposed rules. U.S. Fish and Wildlife Service. 2011a. American eel, Anguilla rostrata. Fact sheet. U.S. Fish and Wildlife Service. 2011b. Endangered and threatened wildlife and plants; 90-day finding on a petition to list the American eel as threatened. Federal Register. Vol. 76. No. 189. September 29, 2011. Proposed rules.